The low monthly fee includes your membership with the headquarters in Tokyo and designates you as an official member of Meifu Shinkage Ryu organization. 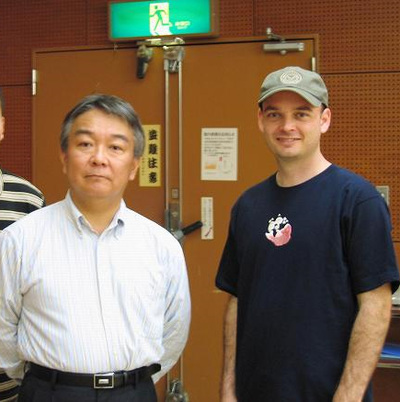 With Otsuka Sensei in Tokyo during our first meeting in March 2009. In Osaka, with Otsuka Sensei in 2011. 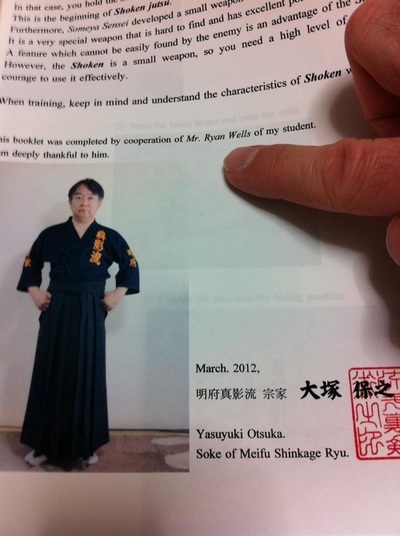 A training booklet created by Otsuka Sensei thanking me for my assistance. High quality, official Meifu Shinkage Ryu shuriken and other training gear are available to all regular members at reduced prices. Some equipment is made available to only Meifu Shinkage Ryu members and cannot be purchased elsewhere. *Students are required to purchase their own bo shuriken within the first 30 days of training. Although Meifu Shinkage Ryu is a martial art, training is quite different from most people's image of what a martial art is. It is unlike Karate, MMA, or other similar sports. 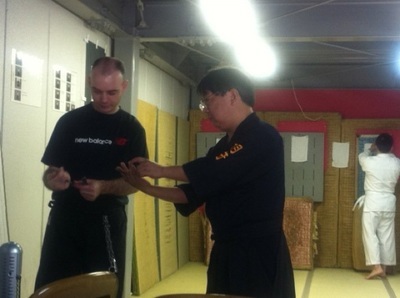 Meifu Shinkage Ryu shurikenjutsu is very similar to archery, marksmanship, knife throwing, and dart throwing. However, there are no competitions, trophies, or weight-classes. Instead, the focus is on improving one's own skills and improving one's self-discipline. Because of this, almost anyone can train in Meifu Shinkage Ryu with confidence. See some YouTube videos HERE! Ryan with his daughter at Otsuka Sensei's favorite shrine in Kyoto, Japan. The name of the shrine is Fushimi Inari.